Add new firm. If this is the first firm, the dialog box related to its addition will appear immediately after you log in. If it is not the first firm - add through Settings - Firms and reporting periods. Add the period to be covered by the reporting. If this is the first IFRS reporting, please note the following. For example, we make 2013 reporting. It means that the first year is 2012, otherwise we won't have comparable data for the past year in 2013 reporting. That is why, when creating a period, check "Create comparable previous year period" - the software will create two periods, 2012 and 2013. If you want to have your statements in the currency other than the functional currency, after the period is specified you can add the exchange rate of such currency to the functional currency (for each reporting period you need 3 exchange rates: opening rates, closing rates and weighted average for the period). Fill out the table with numerical data (IFRS section) and text notes thereto. Attention! When filling out the Balance Sheet, first enter data to the end of the past year column, and then fill out the column as of the reporting date. By entering data as of the earlier date you actually change balances for a later date. After the form is filled out, don't forget to save it (see the button on the top of the page). In order to switch the periods, use the current period selection list in the upper part of the screen. There you can also choose the firm to work with from the list. Fill out only those sections (tables, line items), which represent data applicable to your firm. If you do not have biological assets, simply omit the relevant section. Blank sections, tables and line items/columns in the tables will not be printed out and will not overburden your report. a) Data input. You can enter data both starting with Total and in a regular way, starting with amount components. If you enter data to Total line item, you will not disturb the formula - this is our know-how. However, if your sum is inconsistent, cells will turn red. b) Highlighted cells. If a cell turns red, it means that there is inconsistency of amount in the formula, or you have entered various values for one and the same indicator in different places. It is necessary to remedy it. If a cell turns yellow - it means warning, which signifies that tables contain such indicator breakdown and you need to fill it out (for instance, fixed assets breakdown by their types). Attention! If a cell turns red or yellow, you can understand where inconsistency is by right clicking "troubled" cell and choosing "Show by formulas". You will see, how the indicator is made up of all formulas available for it, and if there is inconsistency, you will see it. If a cell is red, i.e. formula doesn't match, but you are not certain if the error is in the sum, rather than in its members, you can choose "-Recalculate" in the menu - the number in the cell will be automatically recomputed as a sum of members. If you need to make adjustment entry to reporting, go to "Adjustments " section. Certainly, you can change any number manually, without addressing adjustment entries mechanism. But when you make changes through adjustments, it is guaranteed that you will not disturb the total and tables consistency. Adjustment entries are made as it is common for accounting software: Debit - Credit. At the same time, the software will request from you necessary data as debit and credit analytics (similar to sub-account), in order to record adjustment records not only to key reporting forms, but also to notes, so that to keep all formulas intact. When making adjustment entries, please note the following. If you make quarterly reporting, rather than annual, the adjustment entry made in the 1st quarter will not affect reporting for 6 months, 9 months and a year. I.e. within a year, adjustment entries do not transfer from one quarter to another, they need to be made again. At the same time, annual adjustments will affect not only the current, but also all subsequent statements: assets or liabilities balances will be recorded there subject to adjustment entries. CI – other comprehensive income. IFRS reporting includes not only a large number of figures, but also descriptive part. The software has blocks specifying the information to be disclosed. Fill them out, leaving out those that are not applicable to your firm. The reporting is ready. If you specify foreign currency exchange rates for the relevant reporting periods, you can choose such currency in options. Statements will be automatically displayed in foreign currency, and line items with translation difference will appear. Attention! If you wonder, what are the components the figure in the cell is made of, right click this cell and choose "Itemize the number". In order to aggregate one report based on all the tables, press "Ready report" button (located on options bar in the upper part of the page in IFRS section). In case of equity method, no data from associate reporting get to parent reporting automatically. In parent company reporting the user records changes in investments, profit share and other comprehensive income from subsidiary through adjustment entries. In case of equity method, reporting is not consolidated line by line, only some of consolidation entries are necessary, which are made by user at his/her own discretion (for example, see below). In case of full consolidation, the software consolidates parent and subsidiary reporting line by line, adding all indicators together, save for equity, and thereafter it gives the user a chance to adjust consolidation - to record goodwill, non-controlling interests, part of retained earnings and other comprehensive income. I.e. the software doesn't force to accept its computation, but rather does all technical work associated with summing up multiple reporting indicators. Now let us see in detail, how it looks in the software step by step. 1. First of all, in order to commence making consolidated reporting, eliminate all the errors (inconsistencies in indicators), which the software shows (red and yellow cells). Even "yellow" warning may result in errors in consolidated reporting. number of months of subsidiary possession in the reporting period (applicable to purchase method, when subsidiary appeared or ceased to be in the current reporting period; you need to specify the number of months it is in possession). The software uses this value in order to compute the proportion for adding subsidiary turnover indicators to parent data. 3. Now the program knows that B firm is a parent. It means that its reporting may be reviewed in two modes: a) as individual reporting; b) as consolidated reporting. The switch - Consolidated Statements checkbox – may be found on tool bar on all IFRS reporting pages for the parent company. 4. Open IFRS reporting. Check Consolidated Statements checkbox. If you use equity method, you won't see any changes in the reporting figures of the parent. In case of such consolidation, it is sufficient to make several adjustment entries, which the software leaves for user’s discretion (see the example of such entries below). Therewith, in Adjustments section you make adjustment entries for the parent with Adjustment Entry for Consolidation checkbox (that is why it is reasonable to point out for the software that there is subsidiary). Such adjustment entry can be only seen in consolidated reporting (i.e. when the box is checked), and those are the adjustment entries for recording results for consolidation. a) All subsidiary monetary indicators, other than Equity section indicators are summed up line by line. Opening retained earnings aggregate the subsidiary’s entire Equity as of the beginning of the year (A). 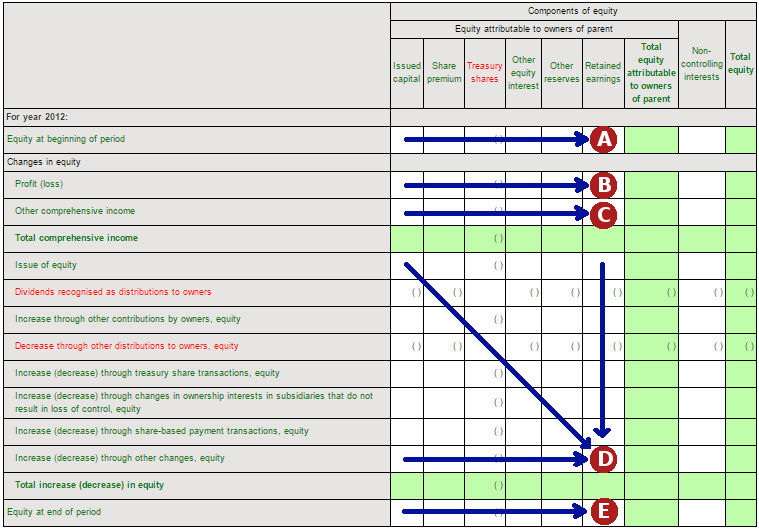 All changes in subsidiary equity that occur within the reporting period, other than Earnings (Loss) and Other Comprehensive Income recognized above are recorded to the Retained Earnings inline items Increase (Decrease) Through Other Changes (D). As a result, closing Retained Earnings will be comprised of entire subsidiary equity as of the end of the period (E). Thereafter, in correspondence with indicators B, C and D you need to record non-controlling interests with goodwill entries, remove investments etc. in consolidated reporting (see example below). c) When summing up all turnover indicators (revenue, profit, fixed assets receipts and disposals etc.) the software multiplies source subsidiary data by ratio = number of months of subsidiary possession / number of months in the reporting period. For instance, if subsidiary is in possession for six months, the ratio in annual reporting is 0.5. This is applicable, if subsidiary was purchased or disposed of within such reporting period. Therewith, in order to retain consistency in Opening Balance + Turnover = Closing Balance, the difference that appears as a result of multiplying by ratio, is recorded to line items of other receipts and disposals, property (liabilities). d) If subsidiary was purchased or disposed of in the current period, balances from subsidiary reporting as of the end and the beginning of the period respectively, are recorded to the turnover of the current period in the same "balancing" line items as specified in cl. c). The steps described in cl. a through d are automatically performed by the software when any reporting is opened that is consolidated by purchase method. Such changes are not saved to the database, they are performed each time when consolidated reporting is displayed. Knowing and understanding this you can bring consolidated reporting to full compliance with IFRS using several adjustment entries (depending on your specific circumstances) (cl. 5). 5. The software "technically" aggregated reporting: retained accurate bottom line and consistency of indicators. However, this consolidated reporting is not final, you need to adjust key reporting indicators and make consolidation entries. Such entries are made as the adjustment entries of parent (Adjustment Entries section); do not forget to check Adjustment Entry for Consolidation checkbox, otherwise, entries will not be displayed in individual parent reporting thus misrepresenting it. Below see examples of such adjustment entries in Annex 1. 6. With the help of adjustment entries it is necessary to eliminate intergroup turnovers. We also need to make such entries by checking Adjustment Entry for Consolidation checkbox so that those be displayed in consolidated reporting only. If this is your first reporting in the software and associate already existed as of the beginning of the year, you need to record investments through opening balance (entry). Record the associate's share of profit for the reporting period, which is referred to parent. Record the associate's share of comprehensive income for the reporting period, which is referred to parent. Changes in investments to the associate as a result of other changes in equity (other than above). Establish goodwill. Entry is made once, when subsidiary is purchased. If the purchase took place before you started making reporting in the software, amount is recorded as an opening balance. As you can see in the entry, in Credit we use D indicator, which incurred a balancing amount as a result of technical consolidation of reporting by the software. Reversing entry (negative entry amount). We need to remove investments made to subsidiary from the balance sheet, which are recoded to parent's non-current assets. If the subsidiary is purchased within the period, when no reporting has yet been made in the software, it is necessary to specify minority interest in balances pursuant to ownership interest by making incoming entry. If investment amount to subsidiary changed within the reporting period in the parent's balance sheet (for example, increased ownership interest), you need to add such difference to the consolidated balance sheet. Record the portion of retained earnings of the current period to non-controlling interests. Asterisk in the entries means that they are reversing entries, which do not affect the essence (as they are used both in debit and credit, amount will pass through), but they are required to be selected when making entries pursuant to calculation dependencies. Please note that this one and the following entry not only transfer amounts in Statement of Changes in Equity, but also ensure that retained earnings and other comprehensive income are transferred from owners to minority in Statement of Profit and Loss and Statement of Comprehensive Income. Similarly to the previous entry, we just assign the part of other comprehensive income to non-controlling interests. If interest ownership was changed within the reporting period, we need to assign minority interest to the special line item in Statement of Changes in Equity. Similar to the previous entry, but for parent owners. Assign the remaining difference, which was not included in the previous three entries, to non-controlling interests.